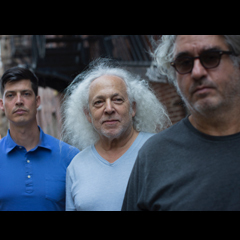 Saxophonist Tim Berne, drummer Ches Smith and guitarist David Torn push far beyond jazz's known boundaries in Sun of Goldfinger. The mercurial trio explores the edges of the genre, infusing it with perspectives ranging from the minimalist to the cinematic to the metallic. The improvisation-based group effortlessly, seamlessly shifts from atmospheres into shattering mayhem to thrilling effect. All three musicians are renowned bandleaders in their own right, with current solo recordings on the prestigious ECM label. Berne has forged a singular path across dozens of expansive, diverse albums featuring intricately-detailed, harmony-driven works. Torn's influence as a guitarist, composer and music technologist is epic. With sounds ranging from the searing and soaring to liquid loops to full-on shredding, he's reinvented conventional definitions of guitar. Smith has established himself as one of the world's premier percussionists, combining acoustic invention with electronics to both propel and extend his myriad musical surroundings.